Our Countertop Model, Single Pocket Full-Page Brochure Holder w/ Business Card Holder enhances your brochure holder with a perfectly attached card holder. 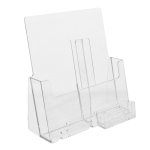 You can choose to attach it to the left or right side of the brochure holder to suit your needs. Our strong clips secure the pocket in place and can be removed at any time or repositioned. 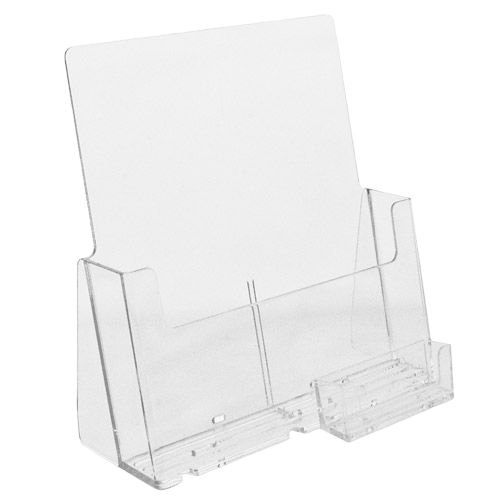 Clearly display 8 1/2'' x 11'' brochures or booklets with business cards, gift cards, coupon and/or discount cards. Real estate open houses, gas stations, restaurant take out menus, event tables, car rental counters, airport information counters, realty offices, and medical offices.